Write the results of Griffith’s experiments in the boxes below. Copyright © McDougal Littell/Houghton Mifflin Company. 5. Which type of bacteria caused disease, the S form or the R form? 6. What conclusions did Griffith make based on his experimental results? S-bacteria to the live R-bacteria. Avery identifies DNA as the transforming principle. the question he was asking or the results of his experiment. the proportions found in DNA? the transforming principle to function? Hershey and Chase confirm that DNA is the genetic material. whether radioactivity was found in the bacteria. 11. Explain what a bacteriophage is and describe or sketch its structure. A series of experiments helped scientists recognize that DNA is the genetic material. them look smooth. The R form did not have a coating, and the colonies looked rough. Griffith injected these bacteria into mice and found that only the S type killed the mice. principle that could change R bacteria into S bacteria. Oswald Avery, another scientist, developed a way to purify this transforming principle. • DNA was present, not protein. • The chemical composition matched that of DNA, not protein. Alfred Hershey and Martha Chase carried out the final, conclusive experiments in 1952. DNA, but not the protein coat, had entered the bacteria. 1. What was “transformed” in Griffith’s experiment? phosphorus? Which molecule is a major component of DNA? could see was phosphorus! Phosphorus is a major component of DNA. inactive. The addition of enzymes that break down proteins or RNA had no effect. DNA structure is the same in all organisms. 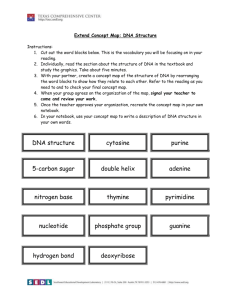 MAIN IDEA: DNA is composed of four types of nucleotides. In the space below, draw a nucleotide and label its three parts using words and arrows. 1. 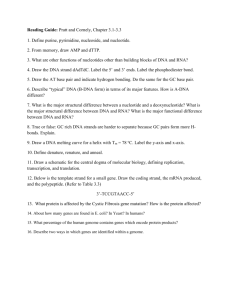 How many types of nucleotides are present in DNA? 2. Which parts are the same in all nucleotides? Which part is different? 3. What did Franklin’s data reveal about the structure of DNA? 4. How did Watson and Crick determine the three-dimensional shape of DNA? at Franklin's X-ray photo's gave them the hint they needed. 5. How does DNA base pairing result in a molecule that has a uniform width? width and fit like a puzzle piece! Nucleotides always pair in the same way. 6. What nucleotide pairs with T? with C? nitrogen-containing bases, and the hydrogen bonds. 7. Explain how the DNA double helix is similar to a spiral staircase. Two strands of DNA wind around each other like a twisted ladder. 8. How do the base pairing rules relate to Chargaff ’s rules? KEY CONCEPT DNA structure is the same in all organisms. have a single-ring structure. The other two bases, A and G, have a double-ring structure. several scientists helped lead to this important discovery. amount of G. This A = T and C = G relationship became known as Chargaff ’s rules. pair this way, which is called the base pairing rules. 1. What did Chargaff’s rules state? 2. What did Franklin’s data show about the three-dimensional structure of DNA? strands that are a regular, consistent width apart. base pairs. Hydrogen bonds between the base pairs; (ex C to G) connect the two sides together. DNA replication copies the genetic information of a cell. Replication copies the genetic information. 1. What is DNA replication? The process in which DNA is copied during the cell cycle. 2. Where does DNA replication take place in a eukaryotic cell? 3. When is DNA replicated during the cell cycle? DNA is replicated during the S (synthesis) stage. 4. 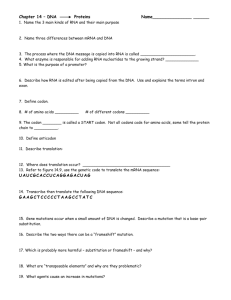 Why does DNA replication need to occur? Assures that every cell in an organism has a complete set of identical genetic information. 5. What is a template? Proteins carry out the process of replication. 7. What roles do proteins play in DNA replication? Proteins- hold the strands of DNA apart while they serve as a template. 8. What must be broken for the DNA strand to separate? 9. Why is DNA replication called semiconservative? 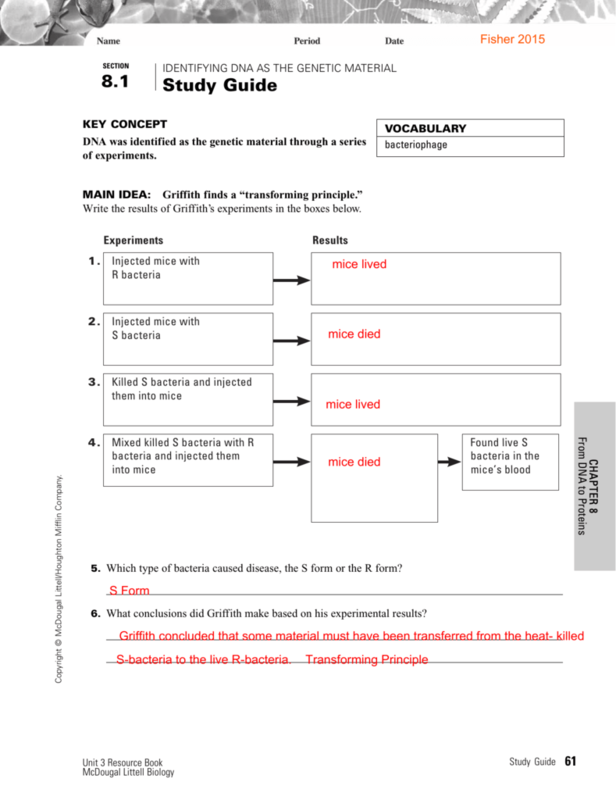 Use words and diagrams to summarize the steps of replication, in order, in the boxes below. Replication is fast and accurate. unzipped so replication can begin. 15. Explain what DNA polymerase is by breaking the word into its parts. Bonds the new nucleotide to the template. 16. Write a short analogy to explain what replication is. play on words. Use your knowledge of DNA replication to write a bumper sticker. KEY CONCEPT DNA replication copies the genetic information of a cell. complementary strand. DNA replication takes place during the S stage of the cell cycle. but we will focus on eukaryotes. • During the S stage of the cell cycle, the DNA is loosely organized in the nucleus. the process. Other proteins hold the two strands apart. 1. Why is DNA replication described as semiconservative? one new strand and one original strand. 2. What are two major functions that DNA polymerase performs? MAIN IDEA: RNA carries DNA’s instructions. each of these processes takes place in a eukaryotic cell in parentheses. 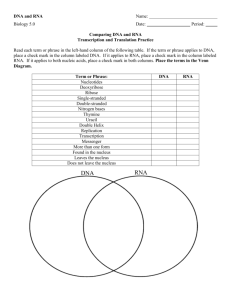 Fill in the table below to contrast DNA and RNA. Transcription makes three types of RNA. 7. What enzyme helps a cell to make a strand of RNA? 8. Summarize the three key steps of transcription. basic function of each type of RNA in the chart below. The transcription process is similar to replication. (sped up) by enzymes. Both involve unwinding of DNA double helix. 11. List two ways that the end results of transcription and replication differ. 10. List two ways that the processes of transcription and replication are similar. Label the parts on the lines below. 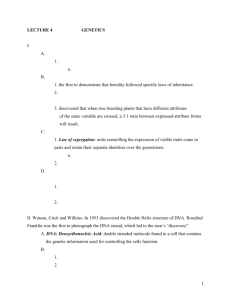 Summarize the steps of transcription in the boxes. KEY CONCEPT Transcription converts a gene into a single-stranded RNA molecule. from DNA to RNA to proteins. combination of accessory proteins help RNA polymerase recognize the start of a gene. RNA polymerase is a large enzyme that bonds nucleotides together to make RNA. Transcription makes three main types of RNA. • Messenger RNA (mRNA) is the intermediate message between DNA and proteins. It is the only type of RNA that will be translated to form a protein. • Ribosomal RNA (rRNA) forms a significant part of ribosomes. 1. 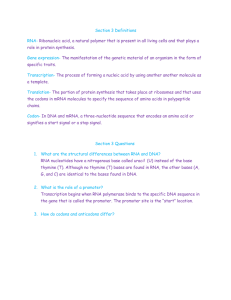 What is stated in the central dogma? 2. What are the three main types of RNA? Which is translated into a protein? specific structures that can catalyze reactions, much like an enzyme. into a polypeptide, or protein. Amino acids are coded by mRNA base sequences. 3. 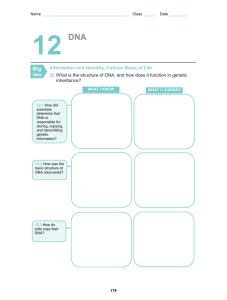 Would the codons in Figure 8.13 be found in a strand of DNA or RNA? 4. What is a reading frame? reading frame changes the resulting protein. Refer to Figure 8.13 to complete the table below. Amino acids are linked to become a protein. an mRNA message into a polypeptide. subunit of a ribosome holds onto the mRNA strand. subunit of a ribosome has binding sites for tRNA. Fill in the cycle diagram below to outline the steps of translation. start codon of mRNA strand. amino acid attaches to mRNA at the start codon. one of three stop codons. 13. What are AGG, GCA, and GUU examples of? What do codons code for in addition to amino acids? between mRNA and amino acids. Translation is the process that converts an mRNA message into a polypeptide, or protein. non-overlapping codons, a sequence of three nucleotides that code for an amino acid. same in almost all organisms, so it is sometimes called the universal genetic code. continues to be repeated until a stop codon is reached and the ribosome falls apart. 1. What is a codon? A sequence of 3 nucleotides that code for an amino acid. 2. What role does tRNA play in translation? small subunit binds to the mRNA strand. 3. What forms the bond between neighboring amino acids? Prokaryotic cells turn genes on and off by controlling transcription. 1. Why is gene expression regulated in prokaryotic cells? the start of a gene. needed to carry out a task. 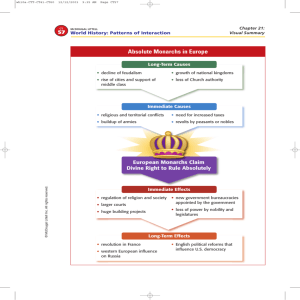 Complete the cause-and-effect diagram below about the lac operon. Eukaryotic cells regulate gene expression at many points. 10. Why do the cells in your body differ from each other? 11. What role do transcription factors play in a cell? 12. What is a TATA box? 13. What is “sonic hedgehog” an example of? element: cap, exon, intron, tail. 14. What is the difference between an exon and an intron? 15. Make an analogy to help you remember what a promoter is. because there is no separation between DNA and the cytoplasm. sequences are called exons; the sequences removed during processing are called introns. ribosome. A tail is added that helps the mRNA strand exit the nucleus. 1. How does the presence of lactose enable RNA polymerase to transcribe the lac genes? transcribed as a unit, and they are often controlled by a DNA sequence called a promoter. polymerase can transcribe the lac genes. 2. What types of DNA sequences help eukaryotic cells regulate gene expression? 3. What happens during mRNA processing? 1. List two types of gene mutations. 4. What leads to gene duplication? MAIN IDEA: Mutations may or may not affect phenotype. Mutations can be caused by several factors. 14. 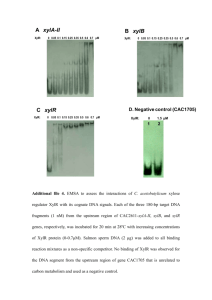 Can DNA polymerase catch and correct every replication error? 15. What is a mutagen? 16. How does UV light damage the DNA strand? 13. For a mutation to be passed to offspring, in what type of cell must it occur? 17. What is a mutation? 18. 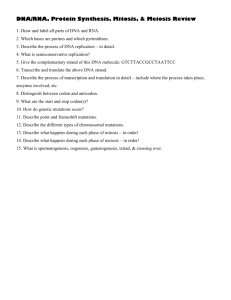 If a nucleotide is deleted from a strand of DNA, what type of mutation has occurred? KEY CONCEPT Mutations are changes in DNA that may or may not affect phenotype. point mutations and frameshift mutations. • A point mutation is a substitution in a single nucleotide. amino acid coded for. Or the mutation may occur in an intron and thus have no effect. messes up protein folding and function. Or it might code for a premature stop codon. to affect offspring, it must occur in an organism’s germ cells. 1. What is a mutation? 2. In a frameshift mutation, what is the “frame” that is being shifted? The codons which come after the mutation. 3. How might a point mutation in a gene affect the resulting protein? for. Or the mutation might result in messing up protein folding and function. including E. coli, baker’s yeast, an RNA retrovirus, a lily plant, a fruit fly, a frog, and a shark. certain number of base pairs. The histogram shows the frequency distribution of the data. with base pairs of 1010. Construct a graph that includes the new data. that was spiral shaped, and formed either a double or triple helix. was published in Nature on April 25, 1953. Several excerpts from their historic paper follow. “A structure for nucleic acid has already been proposed by Pauling and Corey. . . .
worry about the placement of the sugars. hydrogen bonds, otherwise use the same style you used for the Pauling-Corey Model. and having its details interpreted for them. bases . . . One of the pair must be a purine and the other a pyrimidine for bonding to occur. assumptions the other member must be thymine; similarly for guanine and cytosine. between the bases. This time include the detail of the base pairs. had to be on the outside. hydrophobic (“water-fearing”) base pairs on the inside. cellular structure do you know of that has a similar orientation? the active site can make the enzyme nonfunctional. body. Many of these intermediate compounds are toxic. basic amino acid, can completely disrupt the structure of the enzyme. involved in regulation or has no known function. person excretes homogentisic acid in his or her urine. These three diseases result in mental retardation and other serious health problems. 1. What compound accumulates in the blood of people who have PKU? 2. What compound accumulates in people who have tyrosinemia type II? 3. What compound accumulates in people who have tyrosinemia type III? 4. Which enzyme is defective in people with alkaptonuria? symptoms of this disease be prevented in a baby who tests positive for PKU? 6. Would a baby with PKU be damaged by being fed tyrosine? Explain. accumulates in the body until it is removed in the urine. describes. Then write another phrase that describes the same word in a different way. B. Find the Odd Word Put a checkmark next to the word that does not belong. at the bottom of the page to answer the clue. D. DNA Adventure! Solve the clues by filling in the words in the numbered squares.